Large scale protests over the weekend have forced the government into retreat, obliging it to postpone plans for the establishment of new economic zones. Government leaders appealed for calm, appearing shocked by the extent of public anger and the scale of the sometimes violent demonstrations that hit cities across the country. Video footage showed stone throwing youths driving back riot police in the southern province of Binh Thuan where government buildings were also attacked. Footage of plainclothes police violently dragging away protesters in Ho Chi Minh City and elsewhere were also widely shared on social media. The unrest was an alarming reminder to the Communist party of its acute vulnerability in the face of nationalist sentiment, easily aroused by any suspicion that it is selling out to Chinese interests. The protests erupted because of fears that China will exploit the three new special economic zones being planned, particularly a proposal that foreign firms can take 99 year leases on the land. Many Vietnamese see them as potential bridgeheads for Chinese commercial and strategic expansion. Demonstrators also came out to express other grievances, over local government land grabs, environmental pollution and fears about the introduction of a new cyber security law. 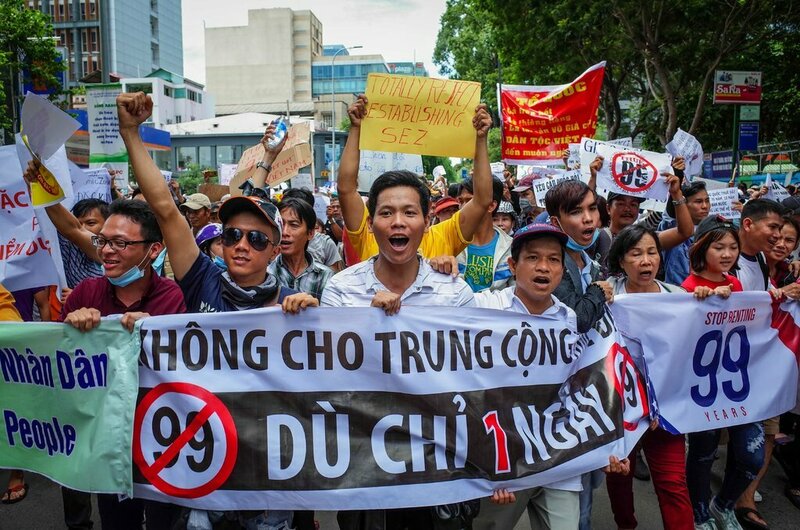 But the catalyst needed to galvanise protests on such a scale has always in recent years been the national question – the suspicion that the Vietnamese Communist party cannot be trusted to resist the encroachments of its comrades in Beijing. The party leadership now sees the need to hold back, reconsider and refine its strategy. The vote on the legislation for the new zones, which was to have been voted on this week, has been postponed until October. Officials have indicated the plan for 99-year leases will be dropped. 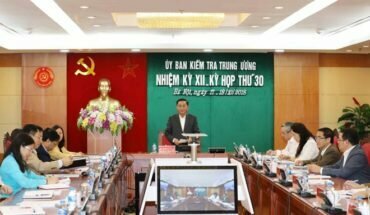 The Chairwoman of the National Assembly, Nguyen Thi Kim Ngan, even acknowledged that many people had been motivated by patriotism. But they had been misinformed and manipulated by what she called “extreme elements”. “The people didn’t correctly understand the nature of the matter and went extreme, and their love for the country has been taken advantage of. This has affected social safety and order,” she said. The Communist party’s great fear is that those campaigning for greater democracy and human rights will seek to undermine the party’s legitimacy by exploiting its weakness over China. The authorities have sought to cover up a series of humiliating climb downs in the face of growing Chinese pressure in the South China Sea, another explosive issue for Vietnamese public opinion. 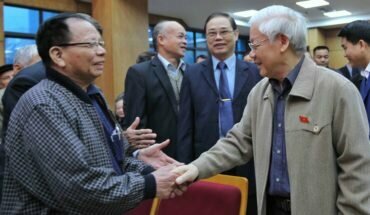 Official media did not report the government’s abrupt cancellation over the last year of two major oil and gas projects inside Vietnam’s own Exclusive Economic Zone. The decisions were taken, at great financial cost, because of ever more explicit threats of military action from China, which is consolidating its military position on disputed islands in the Spratly and Paracel chains. The Communist party is acutely aware of how bad that looks to Vietnamese already infuriated by what they see as China’s overbearing arrogance. The party’s instinct is to try to reassert its long cherished monopoly on news and information with a frontal assault on social media. The National Assembly is due this week to pass a cyber security law that aims to criminalise virtually any views that the government finds difficult and embarrassing. The new law follows the arrest of a long list of independent bloggers over the last two years, many of whom have taken the government to task over its failure to counter Chinese expansionism. 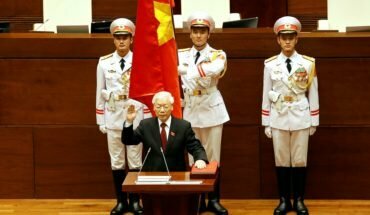 From the outside, the Vietnamese government sometimes appears to hold all the cards, directing the national security apparatus to silence, harass and detain government critics at will. However, the events of the weekend show that public opinion in Vietnam remains highly volatile, and that the Communist party’s Achilles heel – relations with China – remains as acutely vulnerable as ever.